This is a large, somewhat hidden space on the third floor of a Koreatown warehouse, where at night the music rattles the windows of the World Vision Full Gospel Church and other small businesses below. The main room is a dance floor surrounded by couches and armchairs, though there are usually just as many people out on the capacious open patio. 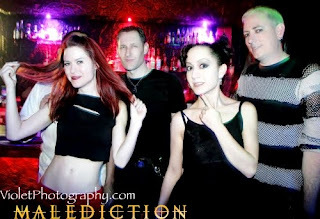 Obviously the vibe varies with the particular event -- I attended the Malediction Society gothic night, with DJ Amanda Jones, but where cameras were not allowed (with the exception of the house photographers).